So, the hubby and I are into espresso and thinking of asking for a machine for Christmas. We're looking at a DeLonghi (in the $200 range). I've read fairly good reviews about the EC702. Slim chance, I know, but do any of you have a machine of your own? Any advice? Thoughts? Machines we should look into? oh gosh, I wish I could help! I love espresso, but I don't own a machine of my own! Happy hunting and I hope you get a great one this holiday season! I have a friend with one from william-sonoma and she lives it. We have a Nespresso Cube...which I'm not sure is still available, but I know their Citiz line is pretty much a slimmer version of ours. 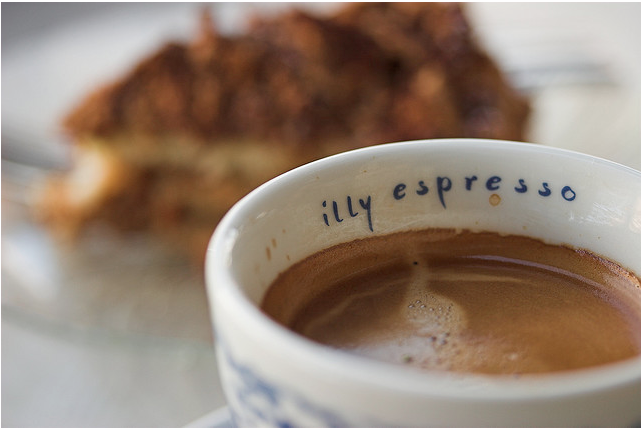 My husband is an espresso nut and he adores Nespresso. We were able to find it on BedBathandBeyond.com--and then use a 20% off coupon. Something to think about ;) Nespresso also has a ton of great flavors, along with awesome customer service! I don't have one : ( but I hope you find a great one! love that mug in the photo! Ashley says the DeLonghi is really good. They have it.... good luck my love!!!!!! !